Farrar, Straus and Giroux, 9780374261221, 208pp. 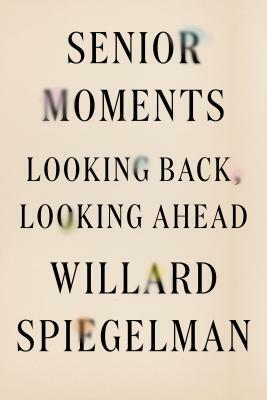 Drawing on more than six decades' worth of lessons from his storied career as a writer and professor, Willard Spiegelman reflects with candid humor and sophistication on growing old. Senior Moments is a series of discrete essays that, when taken together, constitute the life of a man who, despite Western cultural notions of aging as something to be denied, overcome, and resisted, has continued to relish the simplest of pleasures: reading, looking at art, talking, and indulging in occasional fits of nostalgia while also welcoming what inevitably lies ahead. Spiegelman's expertly crafted book considers, with wisdom and elegance, how to be alert to the joys that brim from unexpected places even as death draws near. Senior Moments is a foray into the felicity and follies that age brings; a consideration of how and what one reads or rereads in late adulthood; the eagerness for, and disappointment in, long-awaited reunions, at which the past comes alive in the present. A clear-eyed book of memories, written in eight searching and courageously honest essays, Senior Moments is guaranteed to stimulate, stir, and restore. Willard Spiegelman is the Hughes Professor of English at Southern Methodist University and has been editor of the Southwest Review since 1984. He lives in Dallas, Texas.